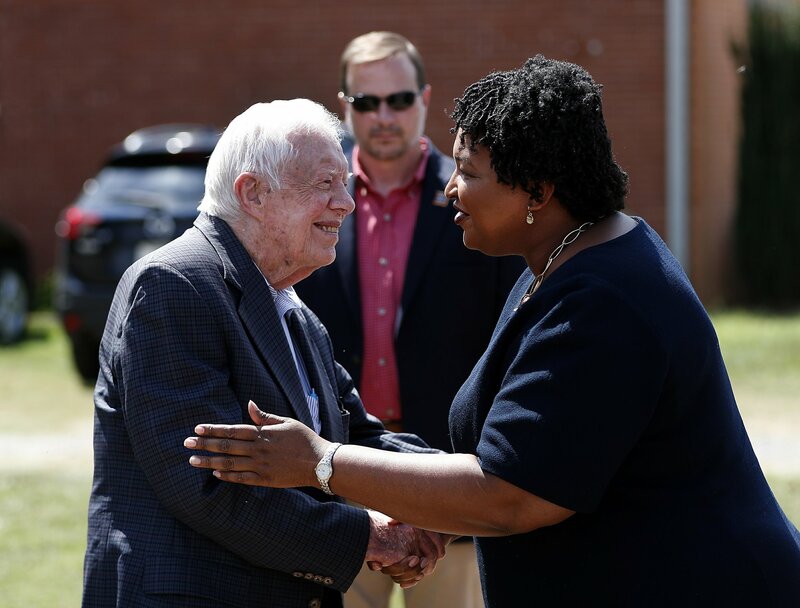 PLAINS, Ga. (AP) — Georgia’s past and its potential future converged in the tiny town of Plains, as former President Jimmy Carter campaigned Tuesday alongside Democratic gubernatorial hopeful Stacey Abrams. Despite their starkly different biographies — he the 93-year-old peanut farmer who entered Deep South politics amid Jim Crow segregation, she the 44-year-old Atlanta attorney who’d be the first Black female governor in U.S. history — the pair of Democratic politicians cited a shared interest in reversing the slide in rural health care services. And Abrams hopes that emphasis can net her just enough improvement in heavily Republican rural Georgia to boost her chances of an upset over her GOP challenger, Brian Kemp, in a state that looks to be on the cusp of becoming a two-party battleground. “Rosalynn and I are fully supporting Stacey for governor, and I don’t want anybody to be doubtful about that,” Carter said, standing in front of his town’s medical clinic, down the block from his 1976 presidential campaign headquarters. “One of the main reasons is our deep concern about medical care in Georgia,” Carter continued. He and Abrams joined in a recitation of dire health care statistics as they chided Georgia’s current Republican leadership, including Kemp, for opposing expansion of the Medicaid government insurance program for poor and low-income workers. More than a half dozen community hospitals have closed in Georgia in recent years under the weight of treating uninsured patients — treatments required by federal law. Abrams said that of Georgia’s 159 counties, 79 have no obstetrician-gynecologist, 64 have no pediatrician, 76 are without a psychologist, 52 counties are without social workers, and nine counties have no physician of any kind. She said the largest provider of mental health services in the state is the prison system. The answer, he and Abrams said, is accepting the federal government’s offer of expanded Medicaid coverage, a deal that would require Georgia to put up 10 cents of every new Medicaid dollar spent, with the federal treasury covering the rest. Georgia, under outgoing Republican Gov. Nathan Deal, is among the 17 states to reject expansion, calling it too expensive. Kemp takes the same posture, arguing that economic development and job growth will expand access to private insurance. Yet those dynamics that Abrams emphasized Tuesday highlight her political challenge and the generations-long shift in Georgia voting habits since Carter’s political prime: White voters in rural and small-town Georgia align overwhelmingly with Republicans. When Carter was elected governor, Georgia had 4.6 million residents, fewer than a million of them living in cities and almost 1.8 million (about 40 percent) of them in rural areas. The 2010 census counted the state’s rural residents at less than 2.5 million in an ever-growing state now estimated at 10.4 million people. The Georgia of a previous generation gave Carter nearly 60 percent of the vote in both the Democratic primary runoff and the general election as he carefully navigated the racial politics of the era, campaigning for Black votes but not explicitly eschewing segregationist Democrats until after he had won. But White Georgians’ shift to Republicans proceeded quickly under President Ronald Reagan, the man who ousted Carter from the White House in 1980. Carter managed to win Georgia in 1980, but four years later Reagan won more than 125 counties as part of his national landslide. The Democratic nominee has won Georgia just once since. Democrats are buoyed this year, though, by a continued demographic shift in favor of an even younger, more urban and nonwhite electorate. Follow Barrow on Twitter at https://twitter.com/BillBarrowAP .